The three-day whirlwind of a retail conference known as National Retail Federation’s Big Show has come to a close. We want to take a moment to reflect on some of the trends that we saw on the floor and in conversation with leaders in the industry. We’ve chosen to focus on the more innovative concepts that permeated banners, booths, demonstrations and presentations. Yes, there were receipt printers and copy machines there in full force, but you might be at the wrong website if you want to read up about that technology. 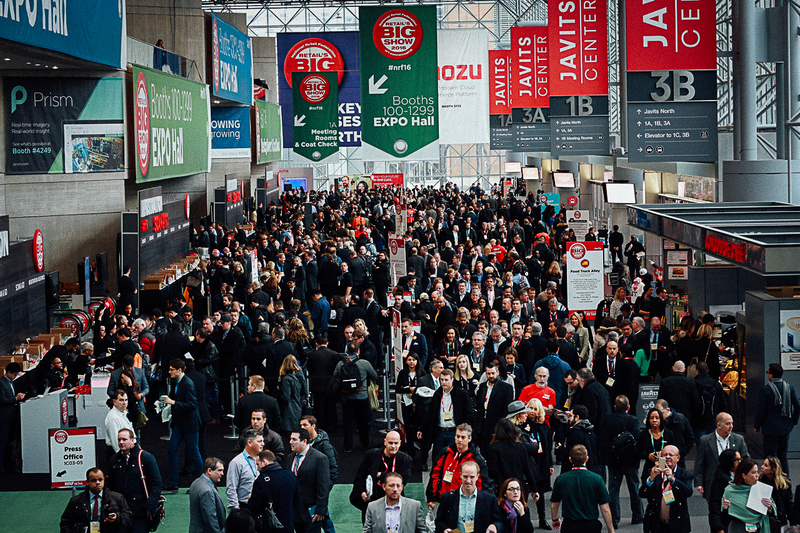 One senior retail analyst who has been attending NRF for quite some time said that Monday (Martin Luther King Jr. holiday in the U.S.) was the busiest single day at NRF he’s ever seen. Without access to actual attendance numbers on that day, this sentiment seemed to ring true. Aisles were packed almost elbow-to-elbow with people walking, talking and scanning badges. Every large technology firm in the market was present in a big way. If there was any question about whether retail is a vertical ripe for advancement, the energy at the event alone provided a compelling argument. For the IoT industry, this means budgets and strategy will align to more progress in the near term specifically in retail. If there was a word cloud capturing the words on banners, booth walls, TVs and handouts, the three trending words would be IoT, bots and analytics. Unfortunately, very few of these solutions and products have matured beyond proof of concepts for small brands. This appears to be the more recent pattern with new companies arriving on the scene, yet taking a year or more to find the right niche and customer willing to invest. There is a potential risk that some of the promises being made with very little to back it up will lead to real distrust that could harm the pace of innovation and willingness to engage in change. We hope to see the work catch up with the language, and vice versa. One notable standout which has made it through this cycle is the Seattle-based company Footmarks. Its beacon implementation at Nordstrom and Nordstrom Rack was not only impressive, but full of the kind of momentum we like to see behind technologies that will fill gaps for retailers moving forward. It appears that beacons might be on the secondary upswing of the hype cycle, after being touted as a cure-all for retail. This was an informed, strategic and well-executed rollout indicative of the kind of effort needed to make new technology successful early on. You get a dashboard! You get a dashboard! You get a dashboard! Everyone has a dashboard! Around every corner was a different dashboard or analytics service. It was incredibly difficult to understand the differentiation between each dashboard. One can’t help but ask, how many different methods of analysis do you really need to be effective day-to-day? Dashboards are a crucial part of the ecosystem as IoT unlocks a vast amount of never been seen data. However, we hope dashboard fatigue doesn’t preclude companies from pursuing meaningful methods of gaining insight and modernizing their platforms from a data perspective. In the meantime, we’ll keep staring at graphs and asking questions until the leaders emerge from the pack. We’re already excited for Retail’s Big Show 2018, and if you’ll be there next year or simply want to connect, don’t be afraid to reach out. We’d love to meet you! For questions or scheduling, you can email bschulz@luxoft.com. Has your virtualization plan enabled innovation?